Miguel Cabrera’s posthumous portrait of sor Juana Inés de la Cruz (1648-1695) is a famous depiction of the esteemed Mexican nun and writer. Considered the first feminist of the Americas, sor Juana lived as a nun of the Jeronymite order (named for St. Jerome) in seventeenth-century Mexico. Rather than marry, she chose to become a nun so she could pursue her intellectual interests. She corresponded with scientists, theologians, and other literary intellectuals in Mexico and abroad. She wrote poetry and plays that became internationally famous, and even engaged in theological debates. Miguel Cabrera positions sor Juana in such a way that the portrait insists on her status as an intellectual. He never actually met sor Juana, so he likely based his image of her on earlier portraits of her, possibly even some self-portraits. Cabrera likely modeled this painting on images of male scholars seated at their desks. Most importantly, he possibly found inspiration in depictions of St. Jerome, the patron saint of sor Juana’s religious order. Images often portray St. Jerome seated at a desk within a study, surrounded by books and instruments of learning (see above). In many ways this is a typical nun portrait of eighteenth-century Mexico. Sor Juana wears the habit of her religious order, the Jeronymites. She also wears an escudo de monja, or nun’s badge, on her chest underneath her chin. 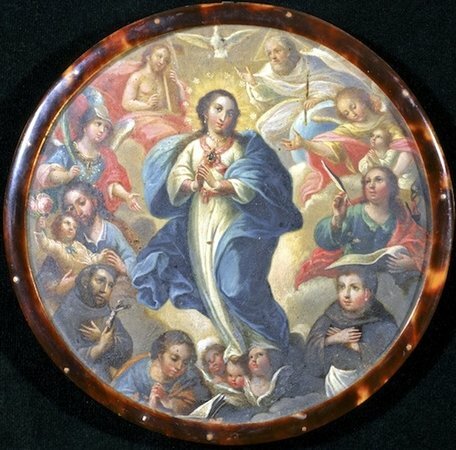 Escudos de monja were often painted, occasionally woven, and they usually displayed the Virgin Mary. Sor Juana’s escudo shows the Annunciation, the moment in which the archangel Gabriel informs Mary that she will bear the son of God. Her left hand toys with a rosary, while she turns a page of an open book with her right hand. The book is a text by St. Jerome, the saint after whom her religious order was named. Cabrera’s portrait differs from other nun portraits in several important ways. She looks towards us, her gaze direct and assertive, as she sits at a desk, surrounded by her library and instruments of learning. 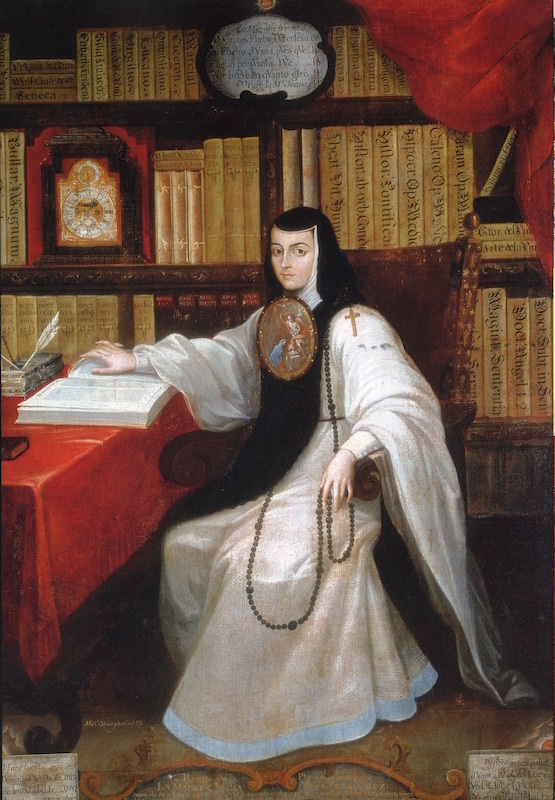 The library here includes books on philosophy, natural science, theology, mythology, and history, and so it reflects the types of works in sor Juana’s own library. Writing implements rest on the table, a clear allusion to sor Juana’s written works and intellectual pursuits. The rosary—a sign of her religious life—is juxtaposed with items signifying her intellectual life. The books, the desk, the quills and inkwell aid in conveying her intellectual status. The red curtain, common in elite portraiture of this period, also confers upon her a high status. Electa Arenal and Amanda Powell, eds. The Answer/La respuesta. 2 ed. (New York: The Feminist Press at the City University of New York, 2009). Charlene Villaseñor Black, “Portraits of Sor Juana Inés de la Cruz and the Dangers of Intellectual Desire,” in Sor Juana Inés de la Cruz: Selected Works, Norton Critical Edition, edited by Anna More (New York: W. W. Norton & Company, Inc., forthcoming Nov. 2015). Marion Oettinger Jr., Retratos: 2,000 Years of Latin American Portraits (New Haven: San Antonio Museum of Art and Yale University Press, 2004). Cite this page as: Dr. Lauren Kilroy-Ewbank, "Miguel Cabrera, Portrait of Sor Juana Inés de la Cruz," in Smarthistory, August 9, 2015, accessed April 24, 2019, https://smarthistory.org/cabrera-portrait-of-sor-juana-ines-de-la-cruz/.